Put up this ground spike and you will instantly have a way to display colorful balloons in your dealership to get attention and get more business throughout the year. Our Reusable balloon kit is the best alternative to helium balloons. This reusable balloon kit can be used over and over. A quick and effective way to display inflatable and reusable balloons in the grounds of your business. If you want to take advantage of the benefits of putting up inflatable balloons in your grounds to attract more visitors and make more sales, this Reusable Balloon Kit with Steel Ground Spike is the perfect option. 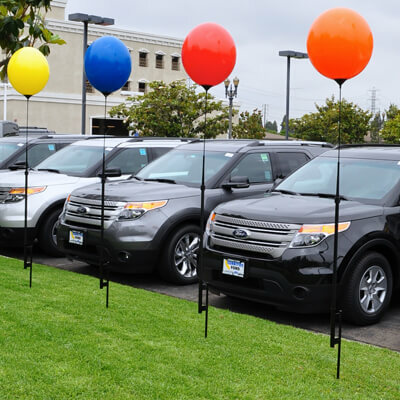 Simple to use, sturdy, and long-lasting, it’s the ultimate way to display balloons and make your dealership look amazing. The ground spike can be inserted into the ground with ease by using a hammer or simply using your foot. This secures the pole to make sure it does not fall over, and you can then simply insert the balloons using the twist lock design, which means you can quickly change the balloons whenever you want to. The balloon holders can also be interchanged with the Reusable Balloon Window Kit. Outdoor reusable balloons are a great way to get more attention for your business, and this ground spike kit is an excellent way to make use of them. We have a range of balloon-related products in our store that you can explore today. See our Balloon Replacement Packs, Reusable Balloon Ground Kit, and Reusable Cluster Kit for a start. And don’t forget our Quick Flow Deluxe Balloon Inflator to make blowing up all your balloons a breeze. You’ll never have to wait around for your balloon kits because we deliver them fast to your business. After you make your order, we’ll get your purchase to you in 1-5 days.